Over the last 30 years, Navdanya has been conserving biodiversity through a network of seed keepers and organic producers spread across 22 states in India and Bhutan. It has helped set up more than 124 community centered, decentralized indigenous seed banks across the country, which are freeing farmers of dependence on costly commercial seeds and helping them move from vulnerability to resilience in the context of climate change. Navdanya pioneered the movement of seed saving, which began in response to the crisis of agricultural biodiversity and realized that conservation of agricultural biodiversity is impossible without the participation of the communities who have evolved and protected the plants and animals that form the basis of sustainable agriculture. The Navdanya program works for promoting ecological agriculture based on biodiversity, for economic and food security. 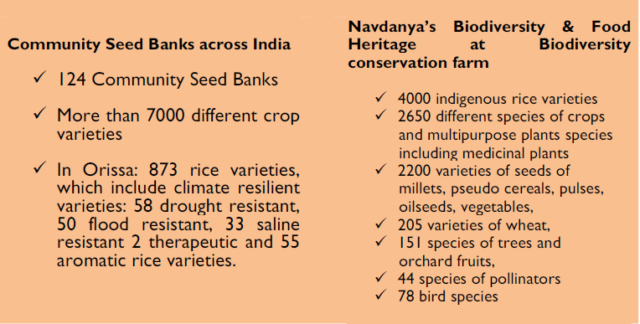 More than 4000 rice varieties have been collected, saved and conserved by Navdanya. Forgotten food crops such as millets, pseudo-cereals and pulses, which were pushed out by the green revolution and expanding monocultures, have been conserved and promoted by Navdanya. Navdanya continues to collect and conserve climate resilient seeds in the seed banks in Uttarakhand, Odisha, Maharashtra and now most recently in Rajasthan, Bundelkhand and Madhya Pradesh. In 2016-2017 a total of over 15000 farmers received seeds from different seed banks of Navdanya such as cereals, millets and other seasonal crops and vegetable seeds. (Watch ‘The Living Seed’ film, produced by Navdanya, which eloquently portrays the contrasts and challenges faced by small farmers struggling with invasive, unsustainable technologies and greed of foreign agribusiness rocking their lives and tearing the fabric of their culture).